Firstly, a reminder for your diaries that our Neighbourhood Plan referendum is taking place on Wednesday 22nd March (7am – 10pm, Thakeham Village Hall). 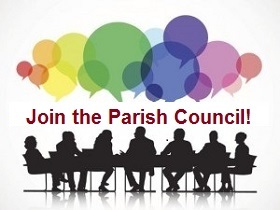 Two Parish Council vacancies have arisen, and we would like to hear from Thakeham residents interested in joining our friendly team. This is a great time to get involved, as we prepare for delivery of the new Village Hall and other facilities over the next couple of years. We would particularly welcome new members who can help us to modernise our communications. To express an interest, or just have an initial informal discussion about what’s involved, contact me or any of our current Councillors. Abingworth phase 2 – HDC decision now due in April: we have been advised by HDC that consideration of the proposal to amend the phase 2 housing mix/numbers will now be considered at the Development Committee (South) meeting of 25 April. We are still looking for help with the Thakeham Village Day (Saturday 17 June). Initially, we need offers of 20 front gardens to take King & Chasemore-branded promotional signs to advertise the event during late May. We are also looking for helpers on the day to run stalls, marshal cars etc. Contact me to get involved.